Air cannon technology has proven itself as an effective flow aid over four decades of use in cement manufacturing, coal processing, ash handling, rock crushing and other applications, write Martin Engineering’s Oleg Meister, Product Development Engineer and Brad Pronschinske, Global Product Manager. Also known as air blasters, air cannons help improve throughput and reduce build-up with an engineered air discharge, dislodging accumulation and preventing build-up that impacts process efficiency and raises maintenance expenses. Common uses include emptying bulk storage vessels, purging boiler ash, improving crusher throughput and cleaning high-temperature gas ducts. There have been many advancements to the air cannon since it became a commercially viable technology in the early 1970s, which have improved cleaning performance, energy efficiency and safety. Among the changes is a high-speed valve design that can be mounted on a smaller air reservoir, yet deliver higher discharge forces than less efficient valves on larger tanks. The new generation of valves produces about twice the blast force output of the designs introduced just a decade ago, saving energy by using about half the compressed air volume. Another energy-saving development is the piston return reservoir. During the air cannon’s firing sequence, the return reservoir’s canister pressure approaches that of the tank, but the fast-acting valve closes with about 50% of the tank’s original pressure remaining. The peak force output remains the same, but air consumption is dramatically reduced, easing the demand on plant air supply and saving money. Air cannons have also become safer in recent years, with new positive-firing valves that respond to an air pressure surge delivered by a solenoid valve. This improves air cannon safety, as discharge requires a positive signal. Unlike negative pressure-firing designs, a cannon equipped with this type of valve will not discharge accidentally in response to a drop in pressure, so an air supply failure or broken line cannot trigger it. In fact, researchers now believe that recent innovations have pushed the performance of air cannon technology near its physical limits, with valve cycles measured in milliseconds and efficiency at an all-time high. For this reason, more R&D effort is now being directed at the nozzles themselves, which create the air pathway that actually contacts the accumulated material. Manufacturers are finding evidence to support the hypothesis that new nozzle designs still hold significant potential for improving overall effectiveness, particularly in applications with difficult materials or extreme operating conditions. The cement industry is an excellent proving ground for air cannon technology, as it presents such a demanding operating environment, including extreme temperatures and abrasive materials that affect nozzle wear and service life. It’s also one of the industries in which air cannon technology is most widely used, helping to solve accumulation problems in preheater towers, furnaces, clinker coolers and storage vessels. Yet the air cannon itself is just one component of the solution. A critical but often overlooked aspect of the system is the heat-resistant nozzle designed and manufactured to deliver the optimum force and blast pattern to suit the application. These nozzles are currently available in a variety of shapes, sizes and materials of construction. Over the last two decades, the most commonly used are cast alloy fan shapes and stainless steel pipes. While a pipe nozzle is reasonably light and easy to install, it has a limited area of influence on a flat vertical wall. In contrast, the fan nozzle typically has a wide area of influence and shorter range, but frequently weighs in at 70 pounds or more, making it hard to install and even more difficult to replace. Installing fan nozzles is especially problematic on an existing system, as it requires torch cutting of the vessel wall, drilling through the refractory, then holding the heavy component in proper position while it’s welded in place. As the evolution of cannon and valve technology nears its logical limits, researchers are beginning to focus more on nozzles as a way to improve system performance, better customizing blast patterns and forces to suit the materials and process conditions of individual operations. The nozzle is the component that takes the stored energy in the form of compressed air and directs it to do work, so it has a dramatic effect on the performance of any air cannon. The application dictates the type of performance needed, including the shape of the air blast, length of the plume, etc. In addition to dislodging accumulated material, a goal in every application is to use the stored energy as efficiently as possible. There has been some advancement in nozzle technology for air cannons over the last few years, such as a 360o retractable design that extends into the material stream only during the firing cycle to protect itself from extreme temperatures and abrasion. This innovative design solves two common industry problems: effectively dislodging accumulations in hard-to-reach areas without shutdown or manual labour, while significantly extending nozzle life. Further, the retractable nozzle can be serviced from outside the vessel, reducing service time and risk of injury. For the most part, however, air nozzles used in today’s high- performance cannons are much like the designs used 20 years ago. Manufacturers offer a range of shapes, sizes and blast patterns to accommodate different materials and process conditions, but nozzle styles and performance have not changed significantly. Even after its long service history as a material flow technology, air cannon users still have a relatively small inventory of nozzle choices for high-temperature applications. Among the obstacles to new nozzle development has been the lack of precision in existing mathematical models for predicting the performance of new designs, particularly with respect to specific materials or conditions. While existing Computational Fluid Dynamics models could simulate nozzle performance in theoretical terms, the results often varied from the actual performance observed in a customer’s process. In addition, prototype manufacturing has traditionally been time-consuming and expensive, further slowing the R&D process. Selecting the optimum nozzle for specific customer operating conditions often took multiple iterations, making subtle changes to obtain the most effective configuration for that operating environment. With the recent advances in numerical flow simulation software and the advent of rapid prototyping techniques, Martin Engineering researchers felt the time was at hand to create a more accurate standardized model and focus on designing new and innovative nozzles to further enhance air cannon performance. The objectives included development of a predictive theory that better reflects actual performance, accelerating the process from concept to prototype and drastically reducing trial-and-error tactics. If successful, the result would be more effective cleaning performance from air cannon systems, with nozzle designs tailored to individual operating conditions. It was expected that engineers would also develop a deeper understanding of customer processes and foster product development that would be truly process-oriented. The benefits would include current product optimization, cost savings and faster development times, ultimately giving customers a virtually unlimited portfolio of nozzle options. The investigation began with off-the-shelf software and CFD theory. Researchers plugged in the physical parameters of existing Martin Engineering nozzle designs and computed a projected blast pattern for each one. The nozzles were then taken to a test station known as a blast table, where they were mounted on a cannon and aimed at a horizontal surface covered with sand. By firing the cannon across the sand, investigators could obtain an accurate representation of the actual pattern for each nozzle design, which was then compared to the area of influence predicted by the software. Following this series of tests, Martin researchers then revisited the CFD modelling program and made progressive adjustments, eventually resulting in a model that accurately reflected the blast patterns of the company’s existing nozzle shapes and sizes. Armed with this customized model, investigators then turned to the development of new nozzle designs which could be tailored for specific customer operations and process conditions. By progressing beyond a standard range of nozzle configurations from which the best-available solution would be chosen for a given application, the objective was to develop the ability to efficiently design and test nozzles developed specifically to suit individual customer processes, thereby delivering more effective cleaning under virtually any circumstances. Further, the customized CFD model will allow the R&D staff to accurately predict the forces and blast patterns resulting from any new nozzle design, without resorting to the expensive and time- consuming process of prototyping and physically testing every one. The first nozzle development project using the new CFD modelling technique was initiated to address one of the most common problems shared by high-temperature air cannon users. Replacement of conventional fan-type air cannon nozzles is a difficult and laborious process that affects virtually all systems at some point. The least disruptive time to install a cannon network is during construction of a new system or assembly of a new vessel. When the air cannon system is designed-in from the beginning, technicians can cut the necessary access holes and weld the nozzles in place with relative ease. Refractory can then be fitted around the nozzle opening. But when nozzles fail and require replacement, the process is much more complicated. Replacing a conventional fan nozzle on existing equipment requires the removal of refractory brick from around the nozzle opening, typically with a pneumatic hammer. The process invariably weakens the surrounding refractory and renders it more susceptible to spider-webbing and subsequent cracking. The air cannon is disassembled from the air supply pipe from outside the vessel, and the failed nozzle is cut from the vessel or pipe, usually with a torch. The new nozzle is welded into place, and the damaged refractory is patched as well as possible, followed by the re-installation of the cannon outside the vessel. In addition to the potential refractory damage, the process is labour-intensive, requiring an extended system shutdown, and also introduces the risk of injury from working in a confined space. A key issue is the chance of misplacement, as even a pitch of just 1–2° can significantly affect a cannon’s effectiveness. In contrast, traditional pipe nozzles can typically be changed from outside the vessel, without a need to alter the refractory inside. The cannon is removed from the pipe, and the nozzle can be drawn out through the vessel wall. Unfortunately, pipe nozzles have a smaller area of influence and are generally unable to deliver the same cleaning action as a fan jet nozzle. So Martin Engineering researchers went to work on designing a type of hybrid, one that would deliver cleaning performance equal to standard fan jets, yet be as easy to remove and replace as a pipe nozzle. prototype and physically observe each design, researchers were able to quickly narrow down the most likely candidates to a very small list. They were able to examine the predicted performance in detail and prototype only those which had shown the most promise in the CFD simulation, greatly increasing the likelihood of success during physical trials. The patent-pending quick-change nozzle design that evolved from that investigation proved that the R&D team could achieve fan jet performance and combine it with the quick access which in the past had only been available from a pipe nozzle. The CFD model had been demonstrated in a real-world situation, helping the R&D team solve a problem that has confronted air cannon users (especially cement manufacturing operations) for years. The benefits are expected to include significantly reduced damage to refractory brick and drastically shorter nozzle service times. By avoiding the need for confined space entry, the new design has eliminated much of the potential risk involved with the changeout process. It also allows system operators to add air cannons to an existing process during a brief shutdown, without completely cooling down the entire system to allow entry into the interior of a vessel. In addition to helping researchers solve a specific problem, the process of developing the quick-change nozzle design and field-proving its effectiveness confirmed the utility and accuracy of the customized CFD model. The Martin R&D team now has confidence that they could approach any process experiencing particle accumulation issues and quickly design and manufacture a nozzle to deliver the optimum blast pattern for that specific application. No longer will air cannon users be limited to off-the-shelf choices or lengthy development times to test new designs. The customized software can be used to predict the blast pattern on an unlimited array of variations, and prototyping can be confined to the very limited number of configurations that best suit the individual process at hand. The benefits of specifying high-efficiency air cannon systems networks for cement manufacturing can include lower energy costs, reduced maintenance, improved safety and greater total output. As the evolution of cannon and valve technology nears its logical limits, researchers have turned to the nozzles themselves as the next opportunity to enhance air cannon performance. By customizing existing computational modelling software, Martin Engineering researchers have developed and confirmed an accurate method of predicting nozzle performance under specific operating conditions, allowing the company to develop nozzle designs for optimum effectiveness, while significantly reducing time-to-market. In fact, Martin Engineering researchers have already used the model to project the performance of hundreds of new nozzle designs. Martin Engineering supplies bulk material handling equipment around the world for a wide variety of applications, including mining and coal handling, biomass, cement/clinker, rock/aggregate and other materials. Founded in 1944, the firm is headquartered in Neponset, IL, offering manufacturing, sales and service from factory-owned business units in Brazil, China, France, Germany, Indonesia, Mexico, South Africa,Turkey, India, the UK, Japan, Russia, Peru and under exclusive licence with ESS Australia. A major contract was signed recently by AUMUND India to furnish all the necessary equipment for a second production line at the Wonder Cement plant at Nimbahera in India. The contract worth €5 million includes 32 individual machines from the AUMUND product portfolio. Due to the ongoing very successful and reliable cooperation in servicing and supplying Line I at Nimbahera, AUMUND India was invited to tender for the installation of Line II. A convincing proposal was compiled within only five days. After short and intensive negotiations, Raju Gupta (managing director of AUMUND India) and Ibrahim Ali (director of Wonder Cement) signed a contract in June 2014 at Udaipur, India, permitting AUMUND to supply all machines needed for the construction of a second production line at Wonder Cement’s plant located at Nimbahera, District Chittorgarh within the Indian state of Rajasthan. The second production line will increase the plant’s capacity from 3.25mt (million tonnes) per year up to 7mt per year. The scope of supply includes six chain bucket elevators, six belt bucket elevators, seven deep pan conveyors and 13 silo discharge gates. The chain bucket elevators included four double bucket elevators with two designed for a capacity of 1,775tph (tonnes per hour). Similarly, in the belt bucket elevators, the preheater feed elevators have a centre-to-centre distance of 150 metres, handling a capacity of 800tph. 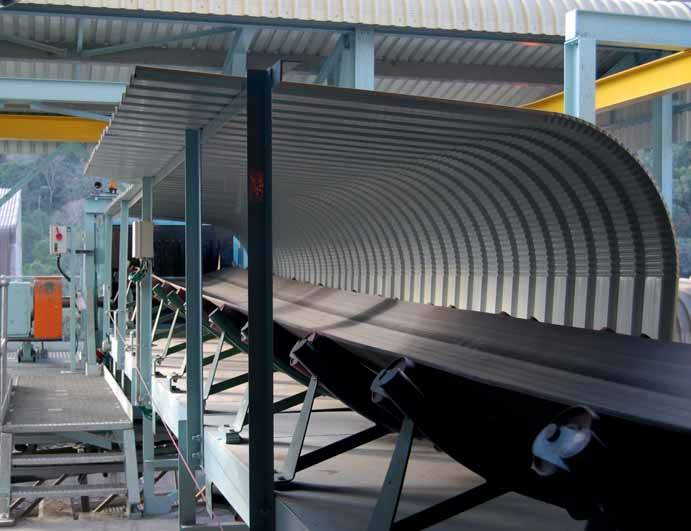 A reversible deep pan conveyor of a length of 162.3 metres is also part of the scope of supply. Beyond the delivery and installation of the machines, it includes supply and maintenance services for the future. Wonder Cement is part of the RK Marble group which is one of the leading names in the marble industry. Its cement plant produces cement in line with international quality standards. The entire design of the plant is based on the latest environment norms, keeping emissions clearly below maximum permissible values. The AUMUND Group is active worldwide. The conveying and storage specialist has special expertise at its disposal when dealing with bulk materials. With a high degree of individuality, both its technically sophisticated as well as innovative products have contributed to the AUMUND Group today being a market leader in many areas of conveying and storage technology. The manufacturing companies AUMUND Fördertechnik GmbH (Rheinberg, Germany), SCHADE Lagertechnik GmbH (Gelsenkirchen, Germany), SAMSON Materials Handling Ltd. (Ely, England), as well as AUMUND Logistic GmbH (Rheinberg, Germany) are consolidated under the umbrella of the AUMUND Group. In conjunction with the headquarters of the manufacturing companies, the global conveying and storage technology business is spearheaded through a total of eight locations in Asia, Europe, North and South America. The largest American-owned cement manufacturer in the nation has solved a build-up problem in the precalciner of its Nebraska plant by installing a network of high-performance air cannons, improving material flow and drastically reducing the need to hydro-lance. The series of 25 air cannons from Martin Engineering fires a powerful discharge of compressed air in a prescribed pattern to remove material that becomes adhered to the vessel walls. The solution helps the plant avoid downtime and eliminate the potential for water blasting to cause lumps of material to fall into the kiln feed and interfere with production. Ash Grove Cement is the sixth-largest producer in the US, with nine manufacturing plants, two deep water import terminals and a major quarry operation in Blubber Bay, British Columbia. In all, the company has a total annual capacity of nearly 9mst (million short tons) of cement, including a wide range of specialty products for difficult service environments. Located on the south bank of the Platte River between Omaha and Lincoln, the facility in Louisville, Nebraska has an annual output of about 1mst per year of Portland and blended cement. When system operators began noticing material buildup in the precalciner, they found that it was impeding the flow through the preheater and into the kiln. The staff used the common technique of water lancing to remove blockages, particularly from the preheater tower’s riser duct. But the time-consuming process had to be repeated twice daily, when maintenance personnel would open access doors into the tower and remove the accumulation with a high-pressure spray. “Efficient material flow is a critical element of dry-process cement manufacturing, and accumulation or blockages can take a big bite out of a plant’s profitability,” explained Martin Engineering’s Andy Marti. “Although many plants still use manual techniques to remove build-up, the cost of labour and periodic shutdowns has led many producers to investigate more effective methods for dealing with this type of maintenance,” he said. In order to prevent the loss of efficiency and clinker quality at Ash Grove Louisville, a group led by process engineer Mark Junkins investigated possible solutions. They met with material handling experts from Martin Engineering, and together the group designed a network of Martin® XHV air cannons for the main production line. Martin Engineering technicians installed the air cannons during a scheduled maintenance outage, starting where the accumulation appeared most severe: below the riser orifice, where the duct is reduced in size to increase velocity. The unique cannon design requires no high-temperature discharge pipes or special mounting plates, and discharge nozzles are embedded directly in the refractory lining of the preheater tower. All of the air cannons in the main production line network are equipped with the Martin Engineering XHV Valve, designed specifically to deliver premium performance and long service life in preheater towers, clinker coolers and other high-temperature applications. The negative pressure-firing valve was developed to provide reliable operation and long service life in challenging applications. The cannons discharge in a timed sequence that moves in an upward spiral around the tower firing about 20 seconds apart, with the entire cycle taking just over eight minutes to complete. Control room operators can alter the schedule to accommodate a range of kiln pressures and operating conditions, extending the sequence to as much as 45 minutes. A crew from Martin Services installed the entire system, including cannons, air lines and controls, as well as the company’s Thermo Safety Shields on each unit. Operating like trap doors, the sliding shields bolt in between the air cannon valve and mounting flange, helping to protect workers from exposure to severe heat, gases and high-temperature materials. production line. For that operation, engineers designed a network of 15 additional air cannons, equipped with Martin® Tornado exhaust valves. Described as the latest advancement in air cannon valve design, the patent-pending Tornado fires in response to a positive air pressure surge delivered by a solenoid valve, which can be located as far as 200 feet away. The unique design improves air cannon safety, since the discharge sequence requires a positive signal. Unlike negative pressure-firing designs, a cannon equipped with the Tornado valve will not discharge accidentally in response to a pressure drop, so an air supply failure or broken line won’t trigger its firing. In addition, this positive- acting valve amplifies the discharge force, delivering up to 20% greater force than a standard XHV-equipped air cannon of the same size. With the new air cannon network in place, the Louisville plant has been able to significantly reduce the need for water blasting. Material now flows more efficiently, and maintenance personnel have drastically reduced the man-hours that were spent on manual removal. Ash Grove Cement Company has established a long-standing tradition of service, reliability and quality that stretches back more than 125 years. A pioneer of the lime and cement industries, the company was incorporated in Missouri in 1882 as the Ash Grove White Lime Association. This article gives an insight for the criteria for the design of the plants for raw materials handling, storage and homogenization in the cement industry. The raw materials influence the investment in the plant due to the design and selection of the equipment. The important factor to note is that the cement process requires the raw materials to be prepared in a certain condition which could be in variance to the available materials. For the cement process, the primary importance is the chemical composition of the raw materials, whereas the bulk handling facility designer is also interested in having the information on sieve analysis, repose angle, flow characteristic, abrasion, bulk density, moisture content and other relevant physical properties. The knowledge of variations in chemical and physical properties of the mined materials is critical to the optimally designed plant. It should also be recognized that the facility to handle and blend the raw materials should cater round the clock under different climatic conditions. Tenova TAKRAF has engineered solutions for cement plants across India. For instance, a cement plant’s most important raw material, limestone, may have vastly varying physical and chemical properties depending on the mine. In such cases the material needs to be blended together (often referred to as ‘homogenization’) over a time so that the variation of properties has minimal effect on production. It is imperative for the system designer to come up with tailor-made solutions for each and every application. In a cement plant there are several raw materials, which require mechanical handling and storage. In cases where homogenization is not an important factor, material storage may consist of a simple stacking arrangement either by overhead travelling tripper or stacker on rails. The simplest storage system envisages coneshell type stacking, where smaller cones are automatically formed over the first fully formed cone. Since blending is not a requirement, the scraper reclaimers operate on the principle of lateral reclaiming. The scraper arm makes a small cut on the sloping face of pile and the reclaimer travels over the length of the stockpile. This process can be fully automatic with active controls for depth of cut and travel speed to regulate the output from the equipment. The type of scraper can be either side (cantilever), half portal or full portal. These scraper reclaimers do provide a minor blending effect since the cones are sliced uniformly during the travel. However, the greater benefit comes out of the flexibility of the equipment, since the travel of the machines in the store is not hindered by the presence of stockpile. This is useful for the cement plant when handling different materials from the same set of stacker and scraper reclaimer or when the process demands different grade of the same material. Good homogenization is provided by the chevron method (Fig. 4) of stacking enabled by a fully automatic control system. The linear stacker moves over the length of the stockpile forming several layers (may be hundreds) over one another. The end cones with predetermined stacking procedure give correction to the extent possible. To diminish the effect of end cones on the product, it is advisable to have a pile configuration having length to width of minimum 4:1. The end cone effect can be completely eliminated in case of continuous stockpile in the circular pre- blending system. A good stacking procedure is a job half done for the purpose of homogenization. To ensure that the product coming out of the stockpile is fully blended,TAKRAF recommends its dependable workhorse, the bridge type scraper reclaimer. The TAKRAF bridge scraper has a large harrow (Fig. : 5) covers almost the entire width of the stockpile. The bridge moving into the pile and harrow travelling across gives a true representation of the cross section. Being large sized, the harrow also needs a short traverse across the pile by means of a hydraulic cylinder, which guarantees minimum wear and maintenance. Cargotec’s Siwertell has received an order from CITIC Heavy Industries Co Ltd (CITIC) for a rail- travelling ship unloader. CITIC is one of China’s largest conglomerates, headquartered in Luoyang, Henan province. The ST-640 M-type unloader has been ordered to support the energy production requirements for a new cement production facility in Burma/ Myanmar and will unload coal from barges at a rate of 800tph. The facility is being built as part of a collaboration between CITIC and the Thailand-based Siam Cement Group subsidiary, Mawlamyine Cement Ltd (MCL). CITIC states that the new production plant will have a cement capacity of 5,000 tonnes per day. “This order has special commercial significance for Siwertell as it will be the first delivery to Burma/Myanmar,” says Ola Jeppsson, Siwertell sales manager. “MLC will benefit from all the excellent attributes of our Siwertell unloaders including efficiency and quiet, safe, environmentally-friendly operations without dust or spillage. “A Siwertell screw-type unloader was the preferred solution for the new Mawlamyine cement plant. Siwertell screw-type unloaders lead the industry and have decades of operational experience and numerous favourable global references. “The low weight of the unit when compared to alternative unloading systems minimizes loads on the jetty and so reduces jetty construction costs,” Jeppsson adds. The delivery is scheduled for mid-2015, and will include an enclosed discharge arrangement for transferring coal to the jetty conveyor. The unloader will be delivered in pre- assembled parts, with final assembly, testing and commissioning taking place on site at Mawlamyine. Siwertell ship unloaders and loaders are based on unique screw conveyor technology, in combination with belt conveyors and aeroslides, and can handle virtually any dry bulk cargo, such as coal, cement, fertilizer, agribulk, clinker, sulphur and grain. Siwertell plant and terminal design, ship unloaders, ship loaders, mobile ship unloaders, mechanical and pneumatic conveying systems, and storage solutions are all designed to ensure environmentally- friendly and efficient cargo operations. Titan Cement UK, based in Hull, recently invited Cleveland Cascades Limited to commission two tanker loader systems purchased earlier in 2014 at King George Dock. The chutes load cement into tanker trucks with closed hatches at rates of up to 150tph (tonnes per hour). The cement is imported from around Europe on vessels, and is air-blown into Titan Cement’s storage silo for truck-loading thereafter. The Cascade tanker units utilize a rubber seal at the outlet in order to create a perfect seal between the chute and the tanker hatch for much improved dust-free loading. The air displacement is controlled by an internal extraction system that works across both chutes and any product extracted is taken back into the silo for re-loading. “While cement is as vital a commodity to fast-growing economies as oil or steel with no other material being as versatile for building houses, roads and infrastructure, it is difficult to transport and potentially polluting if not stored and transported carefully,” says Paul van de Vyver, general manager of DemcoTECH Engineering. As a key supplier of bulk materials handling technologies and services to the cement manufacturing and related industries, South Africa-based materials handling specialist DemcoTECH Engineering offers the global industry a complete solution for the storage and transportation of cement. “As with all the commodity markets we serve, maintaining a clean environment is a priority in all the systems we design and supply to the cement industry,” notes van de Vyver. “As a result, we offer specialized conveying systems, such as troughed AeroConveyorsTM, pipe conveyors and pneumatic conveying systems, which, by providing a totally enclosed conveying environment, assist the client in complying with environmental and safety regulations. DemcoTECH Engineering offers specialist expertise in pipe conveyors, having supplied this technology to a number of cement producers around the world. Besides secure handling of the material, pipe conveyors offer many other benefits, such as being environmentally friendly without the spillage problems associated with troughed conveyors. Pipe conveyors are able to negotiate relatively tight horizontal and vertical curves, which affords the opportunity to eliminate transfer points, reduce the overall length of the conveyor system and improve the plant footprint, and save total costs. “The potential conveying distances and carrying capacity of pipe conveyors have improved significantly in recent years due to improved conveyor analysis capabilities and advances in component design, to the extent that pipe conveyors today offer clients a realistic alternative to conventional troughed conveyors,” highlights van de Vyver. Pipe conveyors designed by DemcoTECH Engineering comprise both fabric and steel cord belting, have up to 2,250 tph conveying capacity and are up to 500 mm in diameter. “We have also engineered two-way pipe conveyors, multiple curve pipe conveyors and distributed drive pipe conveyors with excellent results,” says van de Vyver. “A particular benefit of the DemcoTECH pipe conveyor is that these systems can be designed using a triangular tubular gantry fitted with a mobile maintenance trolley,” adds van de Vyver. Two such travelling maintenance trolleys were designed by DemcoTECH Engineering for a cement producer, each equipped with maintenance power sockets. These maintenance trolleys had to negotiate an incline of up to 15° while carrying four personnel together with spares and tools. DemcoTECH Engineering’s track record in supplying pneumatic systems for the cement industry includes a 150tph (tonnes per hour) pneumatic transport system to convey cement from a kiln to multiple storage silos, also at Nova Cimangola’s cement plant in Luanda. DemcoTECH Engineering offers the full suite of services and technologies for the design and construction of cement and clinker silos in partnership with Kantey & Templer Engineers. All equipment complies with environmental and safety requirements and typically includes airslides, flow-control gates, mobile road outloaders, fully-enclosed cement transport/conveying systems, and dust filters, which provide effective removal of dust from all the areas of dust generation. DemcoTECH with Kantey & Templer completed the new 40,000-tonne capacity, multi-discharge clinker silo at NPC Cimpor’s Simuma Plant in KwaZulu-Natal, South Africa on a turnkey basis. DemcoTECH Engineering is a specialist in the bulk materials handling field, offering its clients a range of services from concept to full, turnkey project completion. DemcoTECH Engineering offers clients conveyor design through to turnkey supply and has completed the design and engineering of large import/export port facilities, gold plants, diamond tailings disposal systems, manganese storage and export facilities, sampling plants and a wide range of other projects including niche process plants. Services include concept design, feasibility studies, detail design, engineering, procurement, expediting, construction and commissioning for a wide range of industries, including the power generation, cement, mining, metallurgy and manufacturing industries, as well as port facilities.